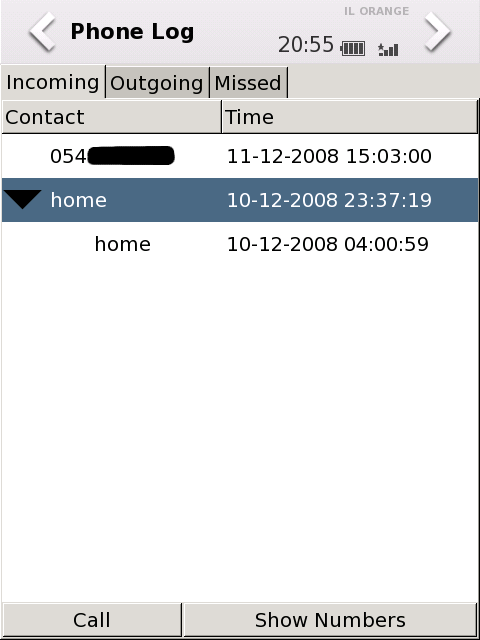 This daemon uses the framework to track and log all the calls made to and from the moko. Because it uses the framework, it's limited to FSO supporting distributions only. The daemon uses sqlite and currently (Read: Has to change) keeps the database in "/home/root/.phonelog.db". 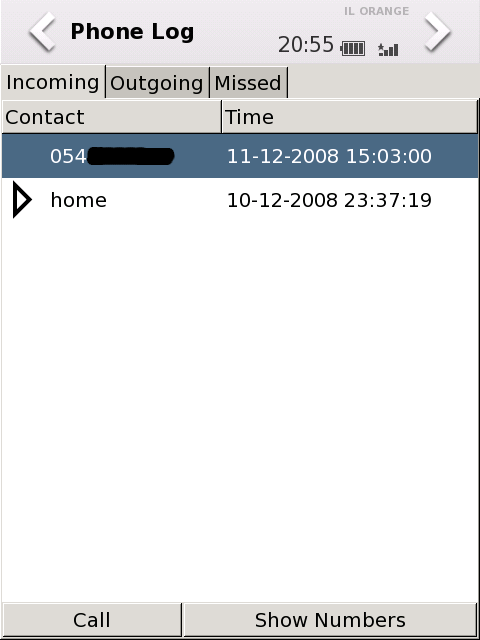 It has a dbus interface which enables pulling out incoming/outgoing and missed calls including the time the call was placed at. This daemon uses the "org.smartphone.opimd" dbus bus name. It's by no means the expected opimd, it's just a daemon that uses this name because it makes sense! This package also includes a working gtk+ gui for use with the daemon. The gui also keeps a file in "/home/root/.phonelog.dat". Install the pyphonelog (gui) package. Install pyphonelogd (daemon) as well. The gui and the daemon are now in different packages, and the packages no longer comply with the older package name. To install this version please first 'opkg remove fso-phonelog' if you had a version older than 0.9.0 before. 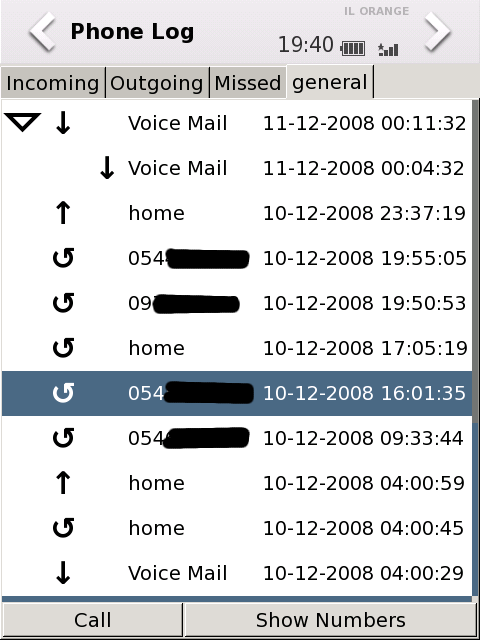 The gui now supports the SHR phone logger so users that run SHR should not install the pyphonelogd. (Actually they should if they don't use the latest git generated package, the logger isn't yet up stream). Fixed a major issue causing the fallback to legacy daemon not to work..
Added a configuration file, it now only supports one option 'phonekitd = True/False' (True by default, falls back to the legacy if phonekitd isn't found, change to False to force legacy use) this option must reside in the configuration file, though many will be added in the future. 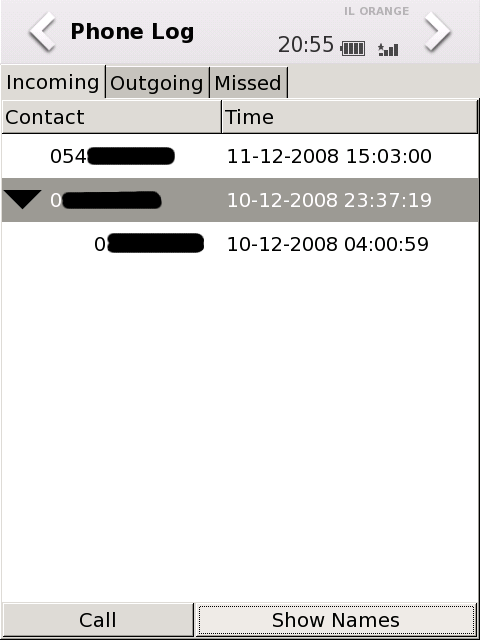 The configuration now resides in ~/.phonelog/phonelog.conf also moved the time file. Fixed the bug concerning the daemon with empty lists. Fixed some major bugs rendering 0.13 useless with the legacy daemon. The done now conforms with gui completely, every gui feature is supported. Added the general list tab. NOTICE: all of the other changes were removed to improve page readability, if you want to view them, please go to this page's history. Watch the TODO file in the git tree.